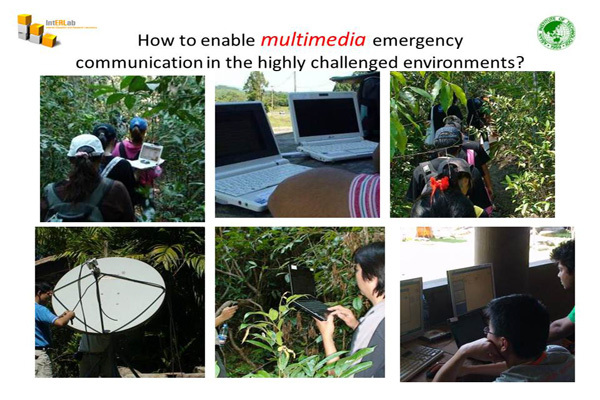 Since its inception in 2006, project Digital Ubiquitous Mobile Broadband OLSR (DUMBO) has been strongly motivated by the fact that large scale natural disasters can wipe out terrestrial communication infrastructure. 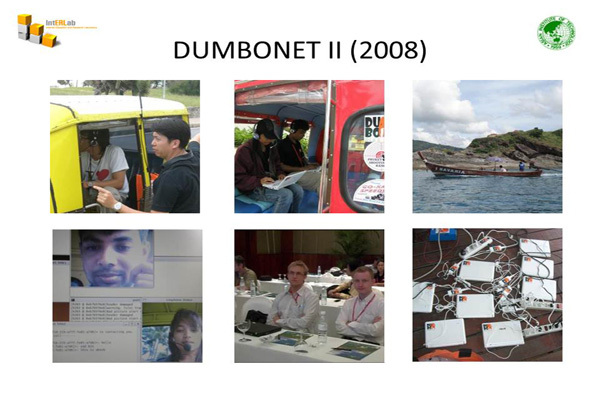 Project DUMBO focuses on the research and development of mobile wireless routers (called DUMBO routers) which can be deployed rapidly in post-disaster emergency conditions to aid the work of rescue workers. Project DUMBO assumes very little about the remaining communication infrastructure. It can totally be a self-contained network deployed in the area, or it can be interfaced with some of the remaining networking infrastructure (e.g. satellite or ADSL internet). 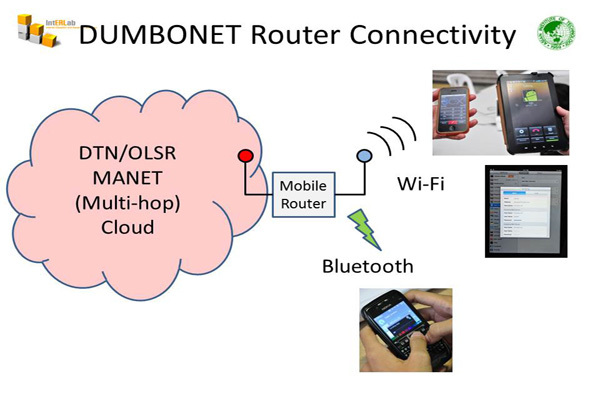 DUMBO routers can automatically form one or more self-configuring, self-healing networks called Mobile Ad hoc Networks (MANET). MANET topology can dynamically change. The common underlying MANET routing protocol that we adopted, the Optimized Link State Routing (OLSR) protocol, continuously senses the change in network topology and updates the routing table at every participating DUMBO router. Being a proactive protocol, OLSR regularly senses if someone in MANET is disappearing or if someone recently joins the MANET – a useful feature when dealing with emergency situations. 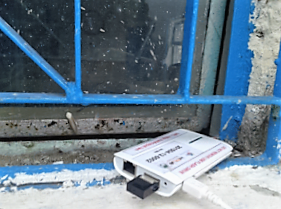 Using lightweight portable mobile nodes as DUMBO routers, the DUMBO routers can be carried by people, vehicles, or even animals like elephants, into disaster-affected areas to expand MANET coverage. The DUMBO routers also provide a mean to interconnect two or more disaster emergency MANETs (e.g. at two or more locations) via satellite or some other remaining terrestrial links. The concept of peer-to-peer (P2P) communication is built into DUMBO routers. The P2P paradigm is decentralized and distributed framework designed to tolerate hardware and software failure. If one mobile router fails, the other remaining mobile router can take over. Rescuers can communicate by using P2P video streaming, P2P voice over IP (VoIP), and P2P short instant text messages. There can be one or more optional command centers. But the command centers are just special peers that may have extra processing power. Conventionally the command centers may be located far away from the disaster site. They are connected to the DUMBO emergency networks in the affected fields via satellite internet or other high speed internet link. An optional facial recognition module can be installed at any DUMBO mobile routers or at the command centers. The facial recognition module helps matching between any unknown person’s face photo taken from the field and a collection of known face images. In addition, sensors can be deployed to measure such environmental data as temperature and humidity. Sensor data can be sent to any mobile router or passed onto the command centers. Since 2008, we have added a number of enhancements and new features to our DUMBO mobile routers. 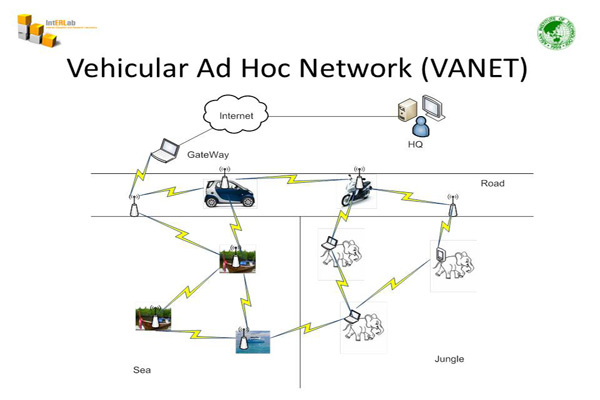 The first addition (2008) is the ability to create Vehicular Ad hoc Network (VANET) characterized by high mobility and more frequent network disruptions. Now you can deploy DUMBO mobile routers on emergency vehicles, letting them communicate and exchange information. Our VANET routing technology is still based on OLSR but with a different set of protocol parameters to better support high mobility scenarios. 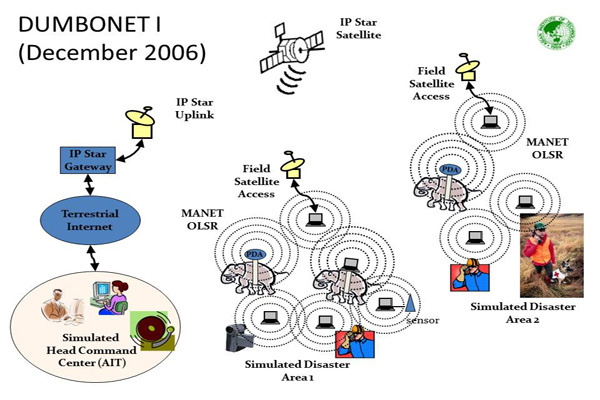 The second addition (2009-2010) is Disruption Tolerant Networking (DTN) technology for OLSR MANET/VANET. An OLSR MANET/VANET may split into several smaller partitions. Some of these OLSR MANET/VANET partitions may later merge into a larger partition. Our specially designed DTN over OLSR MANET/VANET helps dealing with OLSR network partitioning. 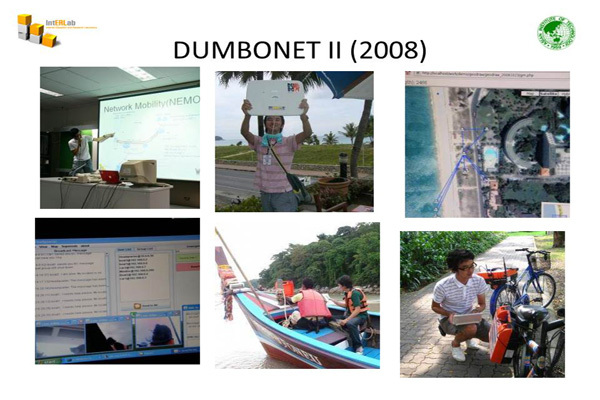 Our DUMBO mobile routers have the capability to store and forward DTN information units called bundles (e.g. any files), waiting until their destinations show up and deliver them. Our DTN over OLSR MANET/VANET has been tested in both low-speed and high-speed mobility scenarios. You can send bundles even you are on moving vehicles. The third addition (2010) is the ability to use a self-contained social networking service, designed specifically for disruptive MANET or VANET emergency networks. 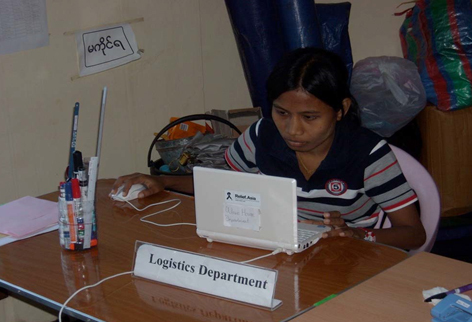 We believe that the availability of the social networking service will aid the work of rescue workers. The fourth addition (2011) is the ability to allow modern smart phones and tablets (e.g. iPad, iPhone, Android phones/tablets) to attach to and utilize the services available in DUMBO MANET/VANET. There is no need to jail-break these devices. 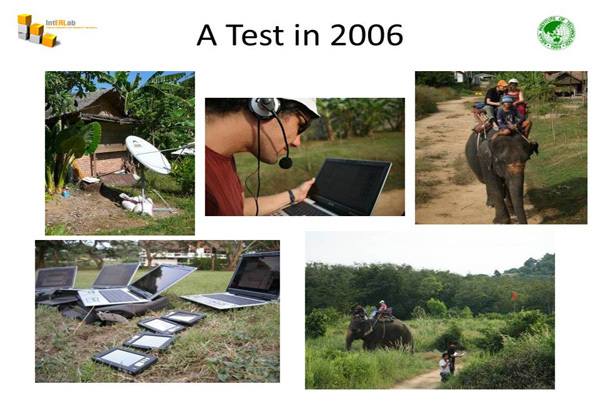 In 2011 and beyond, we are working to create new ways that will allow remote rural villagers to use our DUMBO mobile routers not only in post disaster scenarios but also in their daily lives. We aim to be a significant part of the developing world, to bridge digital divide, and to be a relevant solution to disaster preparedness in rural communities. 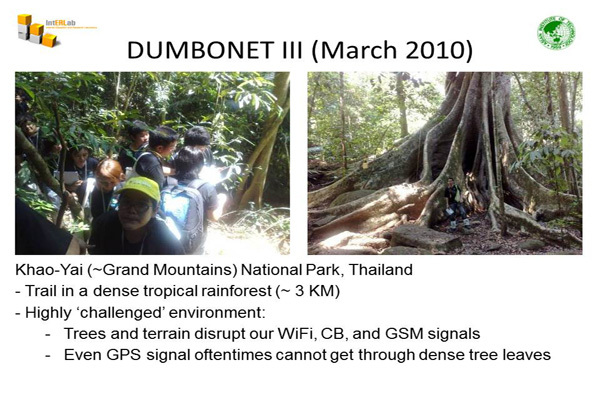 Since 2013, IntERLab successfully adapted DUMBO technology to build low-cost but robust Community Wireless Mesh Networks (CWMN) in rural communities in Thailand to bootstrap internet usage among rural villagers to help people living in rural communities and attending rural school access the Internet at a lower price. 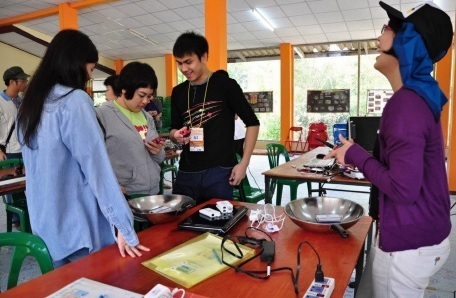 Low-cost, robust CWMN technology is a crucial drive to increase internet usage among rural population in Thailand and other low-income countries in ASEAN region. Thank you for your interest in the DUMBO project. You may additionally find the following presentation (“The DUMBONET Experience”) useful. The DUMBO Project R&D team.